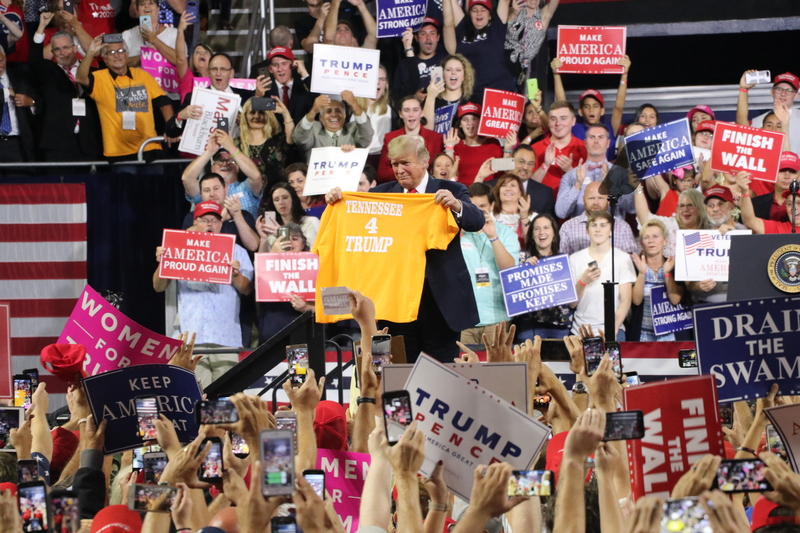 U.S. President Donald Trump gave an energetic speech in front of thousands of supporters both inside and outside of Freedom Hall Monday. With 92,000 tickets claimed, thousands of people gathered in line for their chance to see the president, with some standing in line for upward of 16 hours. Joy Griffin stood in line for over 12 hours. 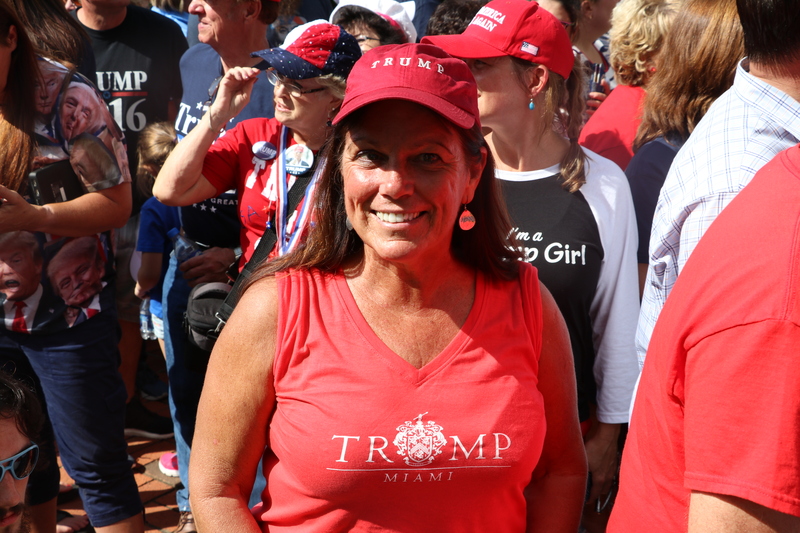 Joy Griffin awaits in line to see President Trump. The thousands gathered in line frequently chanted to keep energy and excitement high. 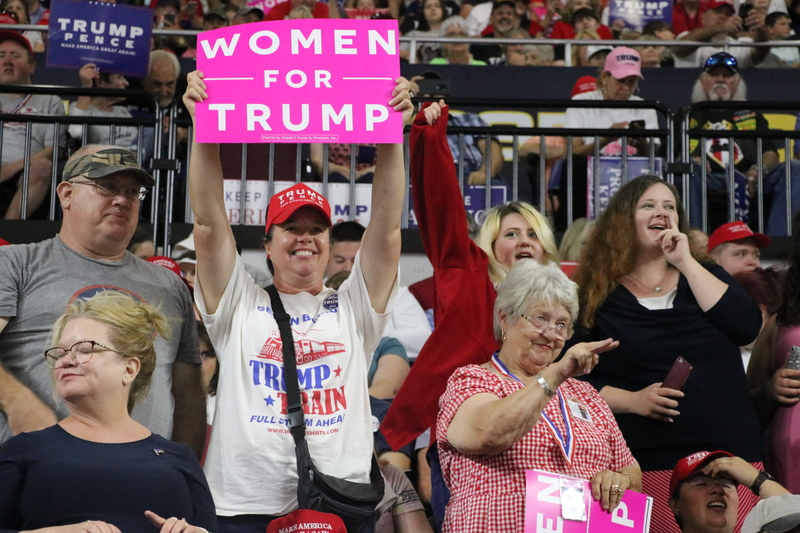 The chants of “lock-her-up” and “U-S-A” were joined with shouts of “Ka-va-naugh” in support of embattled Supreme Court Justice Nominee Brett Kavanaugh, who is facing several sexual misconduct accusations. Protesters and Trump supporters exchanged a bevy of expletives when crossing paths but did not devolve to physical violence — something that could at least in part be due to protesters’ efforts to keep the event civil. “One of the things, for those attending the protest, is we’re trying to make all of our signage positive and more about what Democrats stand for,” Seth Manning, president of the ETSU College Democrats said. 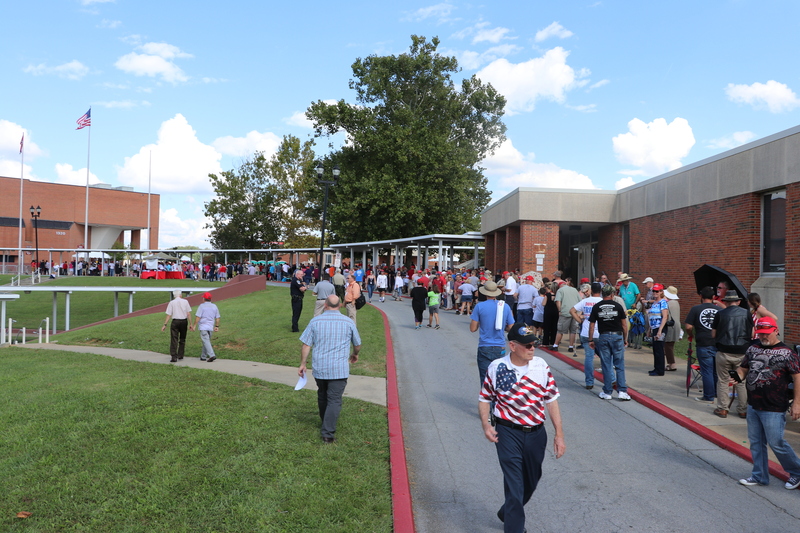 Once Freedom Hall reached its capacity of about 8,500, those still in line were turned to overflow areas. One of which was a concourse outside of the venue with a large screen set up to broadcast the rally. 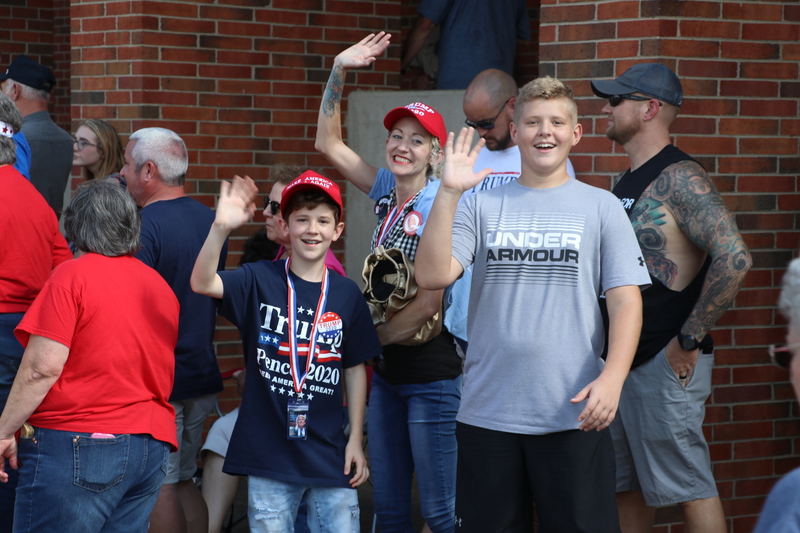 A sea of red “Make America Great Again” hats quickly filled the area, with roughly 3,000 people making their way to the concourse before the president took the podium. 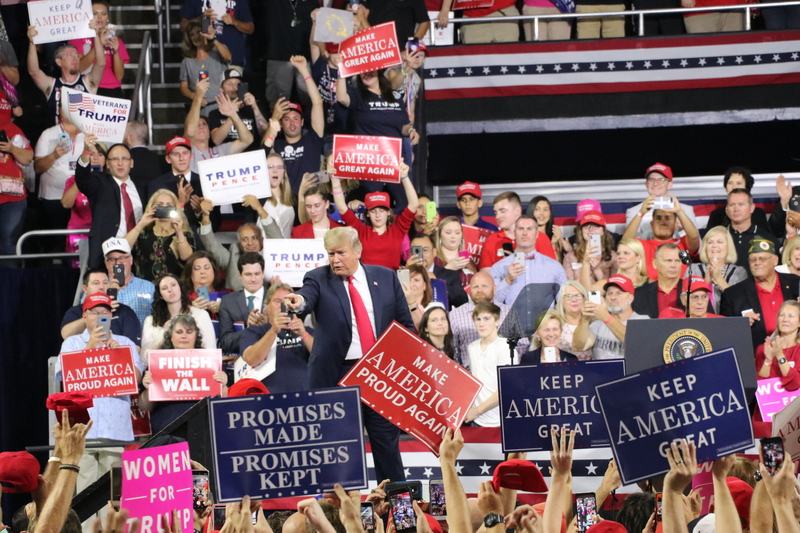 During his speech, President Trump claimed that there were 20,000 people outside. During the rally, Trump was joined by several Republican party officials: U.S. Representatives Phil Roe and Chuck Fleischmann, Gov. Bill Haslam, GOP nominee for governor Bill Lee and Senate hopeful Marsha Blackburn. Gov. Haslam touted Lee’s ability to lead and his integrity before giving way to him on stage, referring to him as “the next governor of Tennessee.” Recent polls from CNN and Fox News give Bill Lee an edge of nine points and 20 points, respectively, over Democrat Karl Dean. 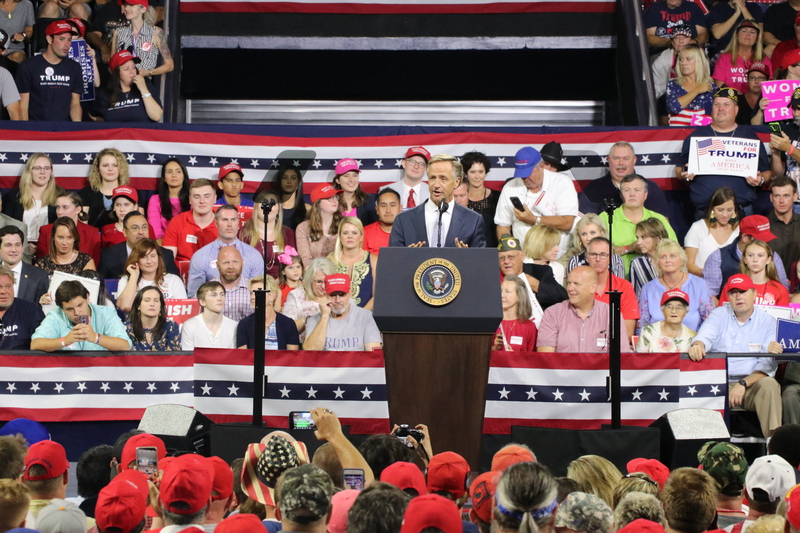 Tennessee Governor Bill Haslam touts Bill Lee’s accomplishments at the Trump Rally. “All these people are here because this might be one of the most conservative places in America,” Lee said. Trump’s speech, however, featured the same fiery rhetoric he’s known for during his rallies. Some topics he hit: Massachusetts Sen. Elizabeth Warren running for president, his recent trade agreement with Canada and Mexico, Phil Bredesen, Democrats and Judge Kavanaugh. Regarding Kavanaugh, Trump viciously defended him to supporters, going on the offensive against Democrats, but not mentioning Dr. Christine Blasey Ford by name. 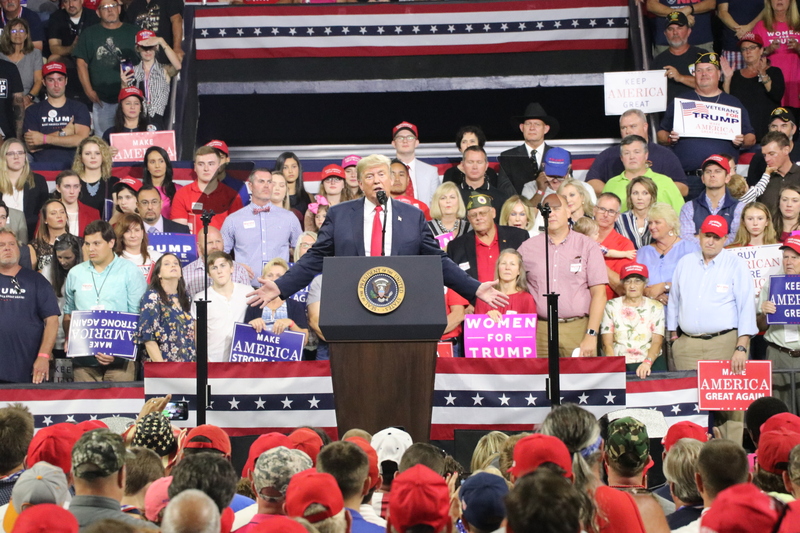 President Trump closed his speech with praise of former President Andrew Jackson and of Tennesseans.